Add a layer of protection to almost any document with a laminator and supplies. Protect your most important business files from damage. A high-gloss, laminated finish not only protects, but adds a professional touch to labels, signs, and name tags. Transform your basic printer into a professional label maker, and print out laminated name tags for any professional event. Even memos and signs on the office bulletin board look more professional with an added layer of lamination.We have the best laminator at SASCO from companies like GBC, Fellowes and much more.Contact us to preserve documents like never before. 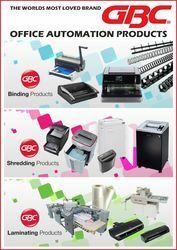 GBC perhaps has the maximum brands and products than anybody else in this industry, no wonder they call themselves INDUSTRY LEADERS , the best sellers are their paper laminators, paper binders, and paper shredders. We are sure you must have heard of their lamination machines cause GBC is short for lamination! From small home lamination machines to big machines for print finishing they have top quality products that have made a name over the years, constant innovation and improvements is why they are still market leaders in this segment. Their Binders are efficient and make office presentations unique, your project is surely going to stand out and admired along with your skills ofcourse. Shredders last but not the least are a big brand builder for them too, Stylish, and modern the design keeps up with changing times, the auto feed shredder is their invention and path setter, others simply copy! Go ahead and be a proud owner of this brand in your office , any one or all their products are definitely going to make your office better, CONTACT US NOW to know more about them and their products for India.